What better time to visit New Orleans than during their biggest annual celebration? 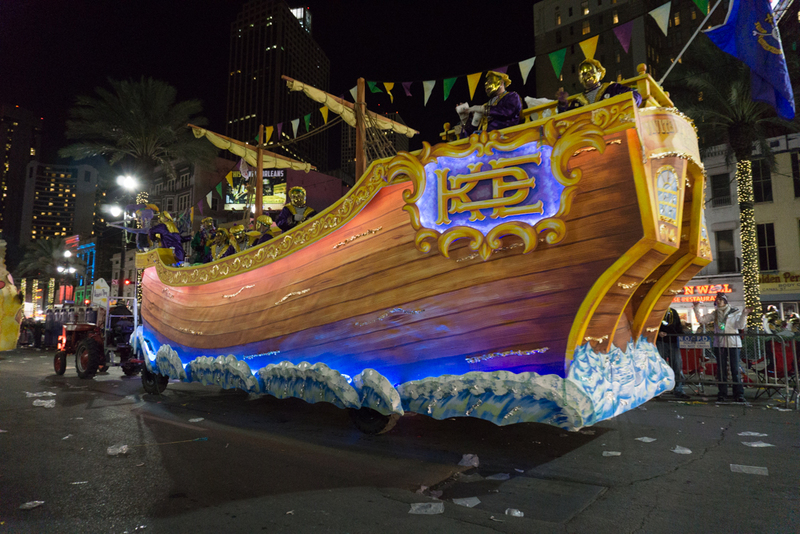 Mardi Gras is a relic of New Orleans’ early French habitation and has been running since the 1720s. Being in New Orleans during Mardi Gras was certainly an enlightening experience! The city is literally in celebration mode, decked out in the official Mardi Gras colours of green, gold and purple, and visitors come from all over to enjoy this iconic event. There's no official theme for Mardi Gras, each parade depicts a specific subject, and the floats are created around the subject, the more popular being history, children's stories, legends, geography, famous people, entertainment, mythology and literature. Some parades have more than 3,000 participants! I particularly loved the college marching bands. So much effort seems to go into the design, construction and decoration of each float that it’s hard to believe some are only used once! The parade we watched seemed particularly political. You need to be ever watchful as the krewes throw baubles, cups, doubloons and all manner of knick-knacks to the excited crowds. I found some useful and fascinating information here. The Mardi Gras parade season officially begins 47 days before Easter each year. Check the dates so you don’t miss it. Be sure to get your hands on a Mardi Gras parade schedule and a New Orleans street map if you plan to visit during the festival. The parades follow various routes throughout the four-parish areas of Orleans, Jefferson, St Bernard and St Tammany. The images in this blog were shot using Sony a6000 and iPhone. The parades move quite fast making it difficult to photograph.